Concordia Stingers captain Olivier Hinse dove for the puck in the dying seconds of the third period. He was on a mission. 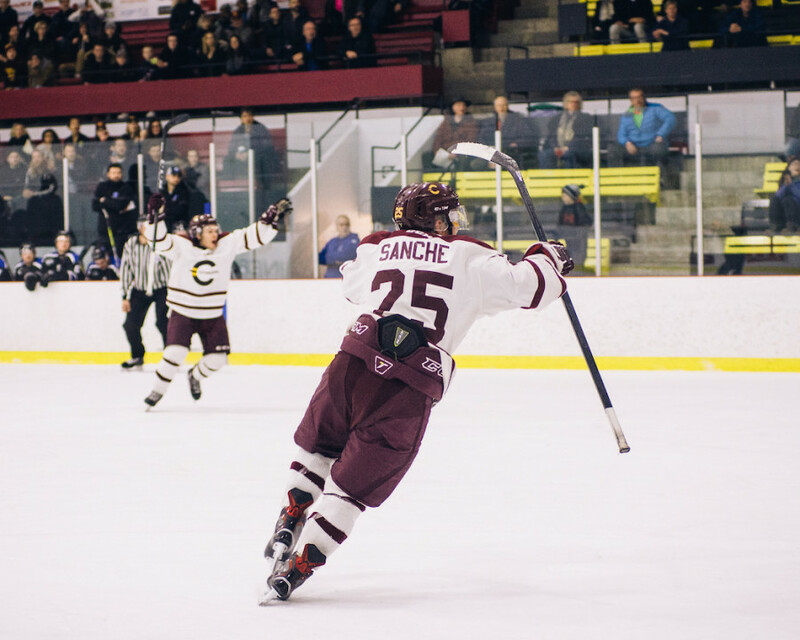 Up by a goal, the University of Ontario’s Institute of Technology Ridgebacks pulled their goalie in attempt to tie the game at three goals apiece and force overtime. However, on this mild winter Saturday night, the fifth-year captain had other plans in mind. A few seconds later, the crowd erupted in cheers; the players were celebrating, jumping up and down, and huge smiles dawned on many of their bearded faces. 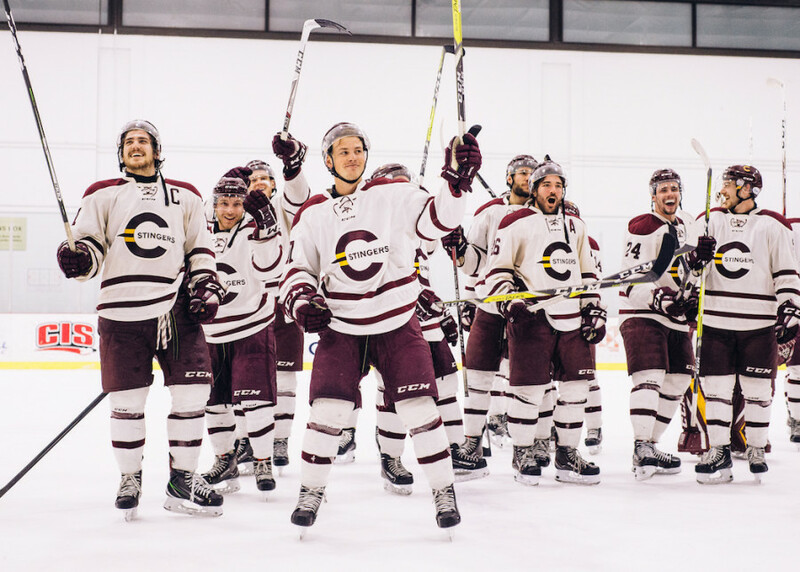 The game was over and history was made: For the first time in 16 years, the Concordia Stingers men’s hockey team won a playoff series—and it couldn’t feel any sweeter. 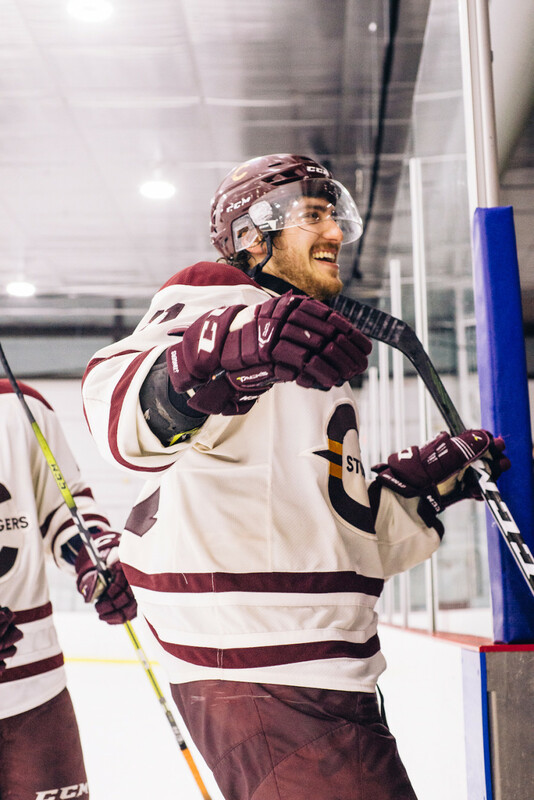 The Stingers, who were coming off a strong 5-2 win the night before, in game two of the Ontario University Athletics playoffs, started the game from where they left off. Scoring three unanswered goals in game two, Concordia came out roaring through the gates, scoring three goals in the first period. Fittingly enough, Hinse was the first player to break the ice, beating Ridgebacks netminder, Tyson Teichmann blocker side after Dominic Beauchemin redirected a Scott Oke pass from behind the net towards the captain. This was the first time the Stingers scored the first goal in the series. Teichmann was starting his first game of the series after replacing Brendan O’Neill—a bold choice from UOIT head coach Curtis Hodgins given that O’Neill was the starter in games one and two. The Ridgebacks were not intimidated by the goal, using their speed to pressure the Stingers in their own. Concordia had couple of close calls as UOIT generated some quality offensive chances, one of which was a floating puck above Stingers goaltender Philippe Cadorette’s net that just went wide. The Maroon and Gold dominated most of that first period, outshooting UOIT 18-12. Despite being on the penalty kill a few minutes after his goal, Stingers forward Raphael Lafontaine went soaring down the ice on a breakaway, deking Teichmann glove side but the goaltender made a pad save. Lafontaine later redeemed himself with five minutes left in the period. From the Stingers’ zone, forward Philippe Hudon passed the puck to a speeding Charles-Eric Legare who received it at the Ridgebacks blue line. Going towards the right-hand side, he sent a cross-ice pass to Lafontaine who made no mistake to beat Teichmann between the legs and make it 2-0. Ridgebacks forward Loren Ulett took a tripping penalty minutes later and the Stingers took advantage when Antoine Masson deflected the puck in the net off a Philippe Sanche pass from the slot. In the second period, the Stingers continued pressuring the Ridgebacks in their zone and forced three penalties. UOIT was not going down without a fight, outshooting the Stingers 12 to five. They couldn’t figure out how to defeat Philippe Cadorette, who ended up turning away 24 shots after 40 minutes. The Ridgebacks did find the back of the net in the third period. Ulett beat Cadorette glove side less than five minutes in. Suddenly, Concordia’s lead was reduced to two goals. Element’s team took four penalties, one of which proved costly. With close to ten minutes remaining in the game, Hinse is sent to the sin bin for high-sticking and UOIT forward Mike Robinson took advantage to turn the game into a one-goal difference. UOIT starting to gain newer and stronger signs of life, repeatedly sent out their top players in but Cadorette made several clutch saves to preserve his team’s lead. Despite the pressure of the game mounting as time went on, Hinse assured that the team felt calm on the bench. To make matters more complicated for the Stingers, forward Philippe Hudon was sent off with six minutes left in the game for checking Ridgeback defenseman Alex Yuill, whose head allegedly went straight into the boards. He looked rattled after the play and was helped to the bench. Element didn’t see the play and could not comment on the merits of the penalty. The Stingers killed the penalty and regained their form that characterized them for much of the game; the team that focused on the little details, fore-checking and making sure they were first on the puck. With less than two minutes in the game, UOIT pulled their goalie for an extra attacker. The crowd slowly began to stand up. The Stingers shutdown any attempt of the Ridgebacks to set up shop in their zone. The buzzer rang; Concordia booked their ticket to the second round of the Ontario University Athletics conference playoffs, where they will face the Queen’s University Gaels next week. Until then, the Stingers players, coaches, families, friends and fans will enjoy their historic win.